You didn’t want metal wire braces as a kid, and you don’t want them now…that is a fact. So, with that being said, are any options available for teenagers or adults with mild to moderate malocclusion (the misalignment or incorrect spacing of teeth) that do not require wires or brackets? Thanks to clear, nearly invisible braces from Invisalign®, the answer is a resounding yes! 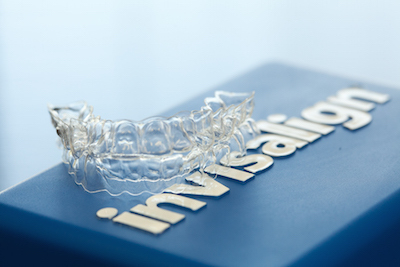 Invisalign® is exactly what it sounds like; a set of invisible (or nearly invisible) braces. The Invisalign® system consists of a series of custom-molded aligners that fit perfectly over your teeth, and over time help straighten your teeth, reduce crowding, or narrow any excess space between your teeth without the use of metal wires or brackets. The Invisalign® system works over a period of time, and while each situation is different, typically treatment is completed over roughly a 2 year period, but again this can change depending on your specific situation. You will receive new, custom-molded aligners every 2 weeks (don’t worry, you don’t have to visit the dentist nearly that often) for the duration of your treatment. 1. The aligners really are nearly invisible. Many people have stated that friends and family members did not even notice they were wearing these clear braces until they told them. It’s fantastic to know that you now have the ability to fix your smile without having to wear embarrassing, cumbersome wire braces. 2. Computer simulation. You’ll be able to see how your teeth will move during the treatment process. These computer simulations are deemed to be quite accurate, and while we cannot guarantee the exact result, it is a great benchmark to measure your progress, and also provides great motivation to wear your aligners as directed! 3. You can take out your aligners as needed. 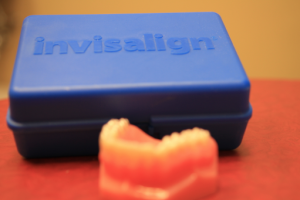 When eating and brushing your teeth you can remove your Invisalign® aligners. With traditional wire braces and brackets, this is certainly not an option! At Smiles at Fairfax Corner, we are an Invisalign® Elite Preferred Provider. If you are interested in clear braces, you simply won’t find a better option in the Fairfax area. Give our office a call today at (703) 997-0928, or click here to contact us and schedule your appointment!